Create your own tab on the Ribbon manual(2010-2016) or with RibbonX(2007-2016), see this page Change the Ribbon in Excel 2007-2016, Note: Only in 2010-2016 you can do this in the userinterface. In the add-in below I add a button to the Quick Access Toolbar (QAT) that opens a popup menu. 2) Unzip/Copy the file to a folder on your system (Use a folder that you backup sometimes). Verify My Add-in is checked in the add-in list and then click OK.
4) If we click on the green arrow in the QAT now the menu will PopUp. Note: It is possible that the green arrow is not working the first time after you install the add-in, close/reopen Excel will fix it this problem. We click on the green arrow button in the QAT and choose "Edit Menu" in the menu. 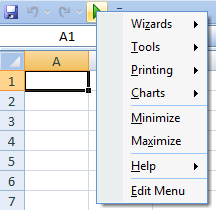 You will now see the worksheet in the add-in with the menu table you see below. Tip: You can download showfaceids.xls from my site to find all FaceID numbers. 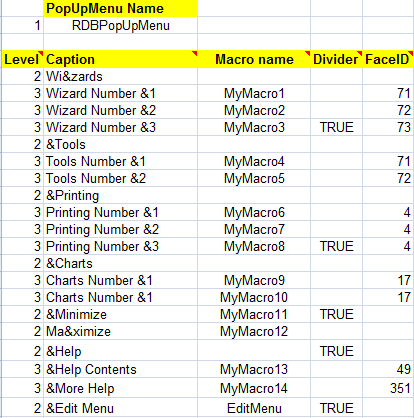 If you want to save this workbook as a add-in then you must change this in the code : Remove or comment the two black code lines in this macro in the PopUpMacrowb module.